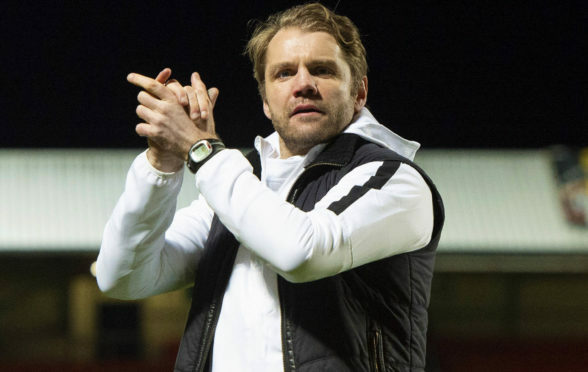 Dundee United boss Robbie Neilson admits he was delighted with the battling qualities his players displayed as they beat league leaders Ross County on Tuesday – now he is looking for more of the same against bottom-of-the-table Alloa tomorrow. The Tangerines kept their title hopes alive with the 1-0 win over the Staggies at Tannadice thanks to a solitary Calum Butcher goal. It was a game Neilson’s men simply could not afford to lose but they coped well with the nerve-shredding pressure and the physical battle with little quarter asked or given. The manager acknowledged that Alloa will present a different type of challenge but the attitude and determination from his players has to be spot on once more. When asked what pleased him most from the County game, Neilson said: “I thought the workrate was excellent, we showed we can compete, we can battle, stand our ground and go toe to toe with teams. “When you get to this stage of the season, when pitches aren’t great and there is a lot of high-stakes football, it becomes more of a pressure game than a football game. “I thought we stood up to that. “A lot comes down to character for me. The character to go out and perform. “When things go against you, you bounce back from it whether that is after the game or during it. While Alloa are bottom of the league at the moment, no-one at United will be taking anything for granted. Jim Goodwin’s men won the last time the sides met at the Indodrill at the end of December and Neilson knows they will try to make things as difficult as possible again at Tannadice. The manager added: “To be honest, if you look at the league, the games are all tricky. “In a league of 10 teams with one automatically down, one in the play-off as well as one automatically up and three in the play-offs, there is not a lot of space in between. “So there is nobody at this stage of the season – or any point of the season – thinking, ‘Right, there is nothing to play for, we will put the kids out’. “So every game we play between now and the end of the season is going to be tough as they are all going for something. “Alloa are a good team and like the majority of teams, they come to Tannadice and it is a big day out, a big scalp. “Their performance levels generally go up and I would expect them to work extremely hard and desperate to get a result. “It will be a different game. Ross County came and were quite expansive, with their full-backs pushing on. “Against Alloa, the full-backs will camp in and make it very difficult to break down. “The fans have been great for us since I have been here. They have helped us as they did on Tuesday night. We need that support again. Meanwhile, Neilson remains hopeful that the two United players who had to come off with injuries on Tuesday, Mark Connolly and Peter Pawlett, will be fit to face Alloa. He said: “They will be assessed but hopefully will be back training tomorrow. “Mark has had a tight hamstring since he came here. “It just tightens up a wee bit and then settles down so hopefully he will be all right. “Peter just felt his groin. It had troubled him before the game but there came a point where it tightened up as well.